This book provides the first detailed account of Gramsci's work in the context of present-day critical and socio-cultural debate. Renate Holub argues that Gramsci was far ahead of his time in offering a theory of art, politics and cultural production which engages these issues at a high level of practical and theoretical concern. She takes stock of Gramsci's achievement with particular reference to the Frankfurt School (Adorno, Horkheimer, Benjamin, Bloch, Habermas) and to Brecht's theoretical writings. She also discusses Gramsci's writing in relation to thinkers in the phenomenological tradition - especially Merleau-Ponty - an angle which has so far received little attention from Anglo-American commentators. She also has some strikingly original points to make about Gramsci's continuing relevance at a time of widespread retreat from Marxist positions among those on the postmodern left. 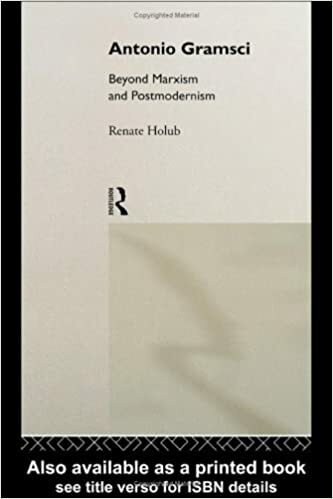 "Differential pragmatics" - in Holub's suggestive phrase - is a theory of cultural production and critique derivable from Gramsci's writings with the benefit of other, more recent ideas, like Habermas's theory of communicative action and the insights of feminist criticism. This book should be of interest to undergraduates and academics; critical theory, political theory, sociology, cultural studies and Italian studies. This book should be of interest to students and teachers of critical theory, cultural studies and Italian studies.